Invented and built by Dave Barton, a 37-year veteran of the heavy-duty towing industry. 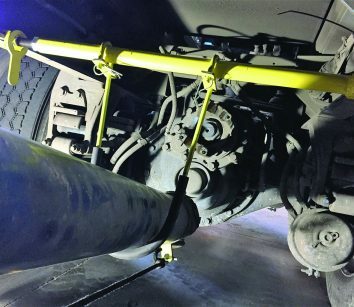 Utilizing a spring-loaded suspender bar installed into the frame of the truck and u-shaped cradle to rest the driveline in, you can now safely tow a truck from the front without completely removing the driveline. Call 209-401-0069 or visit www.drivelinebuddy.com.